Costa Rica is beautiful, no doubt about it. But the tourist industry there is such a well-oiled machine, we were starting to feel like we were in Disneyland. When it comes to travel, we find we’re drawn to places that are a bit little gritty. Also, while not quite as expensive as the UK and Scandinavia (where we spent our last summer holiday), Costa Rica is not the budget destination that we thought we’d find in Central America. So we decided to head up to Nicaragua in search of a more down-to-earth, and cheaper, experience. We bought tickets to Granada on the Tica Bus, a long-distance line that rumbles up the Pan-American Highway all the way from Panama to Mexico. We caught the bus a few miles outside of Bijagua, in Cañas, where it stops once a day. The local “chicken bus” would have saved us quite a few colones, but I had read that the border crossing is complicated enough that it’s worth the money to have the Tica bus driver handle the paperwork. The Tica bus was pretty comfortable, but it was a long journey, and the border process took almost two hours. We got in late to Granada, but fortunately the hotel I’d booked was an easy walk from the bus stop. It’s a sweet hotel, with an inner courtyard and rocking chairs in a big front room that’s open to the street through a grilled gate, just like all the houses here. Funny thing, though – our room is at the front of the building, where all night we’re treated to the sound of a guard on a bicycle riding up and down the street blowing his whistle. The first morning we mentioned this to the desk clerk, who laughed and said that private night guards get in trouble for sleeping on the job, and so this guy blows the whistle all night so the street’s business owners (who employ him) will know he’s awake. and its own saint, Sister Maria Romero Meneses. 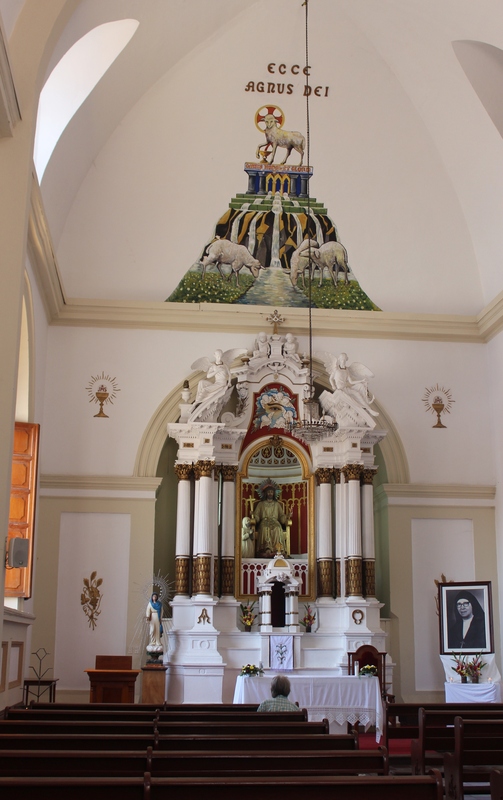 A chapel in the cathedral; that’s Sister Maria Romero’s picture on the right. This entry was posted in Elsewhere and tagged Granada, Nicaragua. Bookmark the permalink.